Archeologists opened this sarcophagus live on air. Courtesy of Discovery. As last weekend came to a close, a team of media-savvy archeologists cracked open an ancient Egyptian sarcophagus for the first time in millennia on live television. In case you missed the Sunday-night spectacle, here’s a glimpse of the discoveries they revealed. The big reveal was part of Expedition Unkown: Egypt Live, which was broadcasted on Discovery, the Travel Channel, and Science Channel. 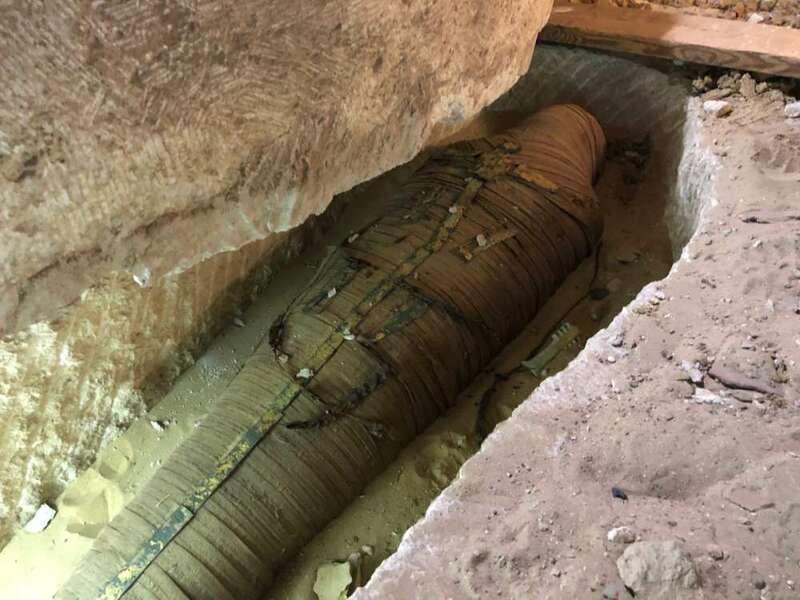 Deep within the inner chambers of an excavation site known as Al-Ghorifa, a team of archeologists and presenters lifted the top of an intricately carved (and extremely heavy) stone sarcophagus. It was the first time the contents had been seen since they were sealed 2,500 years ago. It contained a linen-wrapped body in surprisingly immaculate condition surrounded by golden artifacts and other treasures (image below). The mummy also featured an ornate golden decoration depicting a diety and a scarab beetle. The team explained that this person was most likely a high priest of Thoth, the god of wisdom, magic, and the moon, who lived during ancient Egypt's 26th dynasty. The high-priest beneath the heavy sarcophagus lid. Courtesy of Discovery. 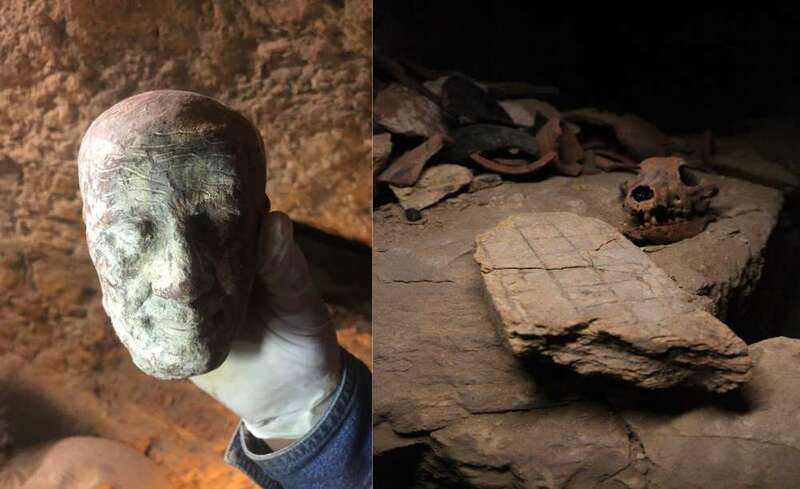 Along with this centerpiece discovery, they also unearthed other members of the same family, including two more mummies and the remains of their dog. One of the mummies was a vibrantly decorated woman wearing a mask and adorned with beads. 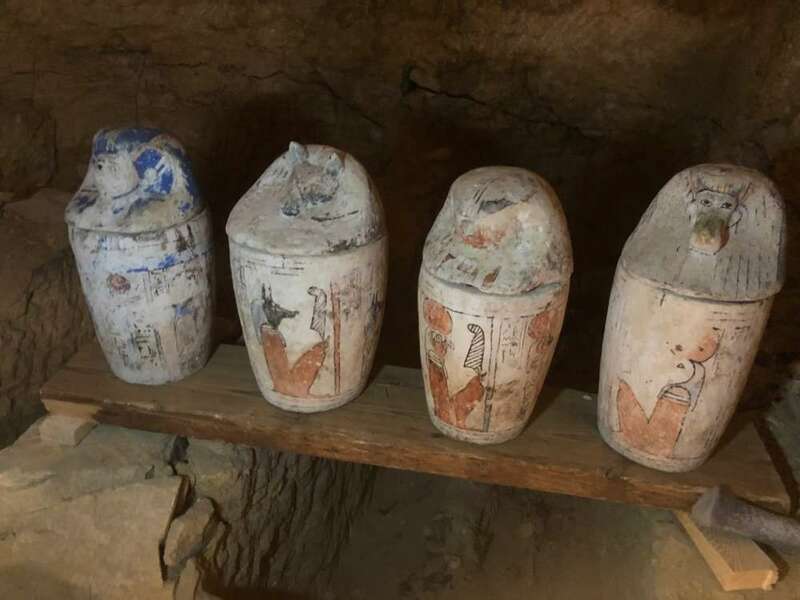 As is often typical with Egyptian mummification, there were canopic jars used to hold the person’s removed organs, just in case they needed them in the afterlife (image below). Canopic jars containing the mummy's organs. Courtesy of Discovery. The team was particularly enthralled by the discovery of a mysterious wax head (image below). This is unusual for this period, according to Hawass, but they think it depicts “Irt Hrw”, one of the high priests. The wax head (left) and the family's dog skull (right). Courtesy of Discovery. Overall, the night proved to be a success, which comes as good news to the Egyptian government. A Discovery spokesman previously told AFP news agency that the show was set up in collaboration with Egypt's antiquities ministry. In the wake of political turmoil, Eygpt's tourism industry has taken a battering. “I am very happy that the program was seen by millions of people from around the world. We are sending an important message that Egypt is safe and we invite tourists to come,” Dr Waziri, the secretary-general of the Supreme Council of Antiquities of Egypt, said in a statement.